I got the chance to see the amazing Blair Thomas perform Hard Headed Heart at In the Heart of the Beast Puppet and Mask Theatre. Heard Headed Heart is made up of three of the artist's solo pieces. 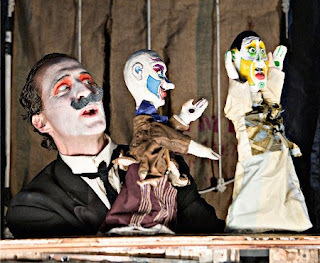 First, Mr. Thomas performed "The Puppet Show of Don Cristobal" which is a raunchy and violent throwback to Punch and Judy-style puppet shows. He makes a lot of innovative choices in the technical and poetic front. For example, he wears a façade/costume that can transform from one character to another with a single spin. Second, he performs his interpretation of "Saint James Infirmary" —which features unique marionettes, a story scroll, and live jazz orchestration which Thomas provides as a one-man-band with the help of a loop pedal. Watch Saint James Infirmary in 3 parts right here! Third, Mr. Thomas performed one of the most amazing works of moving-object-theatre I've ever seen. 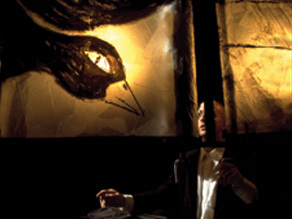 "The Blackbird" is based on Wallace Stevens' book of poetry "Thirteen Ways of Looking at a Blackbird." The Blackbird is made of four side-by-side story scrolls which are backlit and double as shadow screens. Art is painted on the story scrolls in such a way that, at times, the four images form one panorama, at other times, each scroll is a panel in a living comic book. The rhythmic shifting and scrolling of the images creates an animated feel. Meanwhile, Thomas interacts with the images on screen using his own shadow, shadow puppet figures, and even shadow puppet speech balloons. Stevens' poetry is presented in occasional text boxes so that the only sound is the beautiful and contemplative background music created by the band Aurea. Images of The Blackbird are hard to come by online, but Blair Thomas sells a very unique book, hand-printed, made with photos of the show in action as well as transparent pages, poems, and an audio cd hidden in the cover, that tries to capture the feeling of the show. Of course, nothing can compare with seeing these performances in person. So I highly recommend you look to see where Blair Thomas and Hard Headed Heart are going to strike next, and get yourself some tickets.